John Televantos is a Partner at Arsenal Capital Partners, a middle market private equity firm focused in the Specialty Industrial and Healthcare sectors. Before joining Arsenal in 2006, Dr. Televantos was President of Aqualon Company, part of Hercules, Inc.; President and Founder of Helios Chemical Company; and Chief Executive Officer for Foamex International. John began his career with Union Carbide in 1977 in silicones research. He moved through a variety of management positions there and later at ARCO Chemical, where he became vice president of strategy and development. 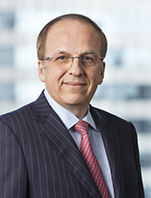 At Arsenal Capital, Dr. Televantos serves as co-head of the specialty industrial practice. During his tenure, he has been part of more than 100 acquisitions and successful exits in the chemicals and materials sectors and has co-led the team that made Arsenal Capital the leading investor in chemicals and materials businesses. In addition to serving on the Boards of several Arsenal- owned companies, he is Lead Director of the Board of Balchem Corp (BCPC). John holds BS and PhD degrees in chemical engineering from the University of London, Imperial College.